Our aim is to remove any rot and restore the frame using traditional materials and joinery skills. The renovation service carefully restores the sash window to its former glory and beyond with a modern draught proofing method. We remove all the excess paint that has built up over years, remove the sashes and renovate the existing box. We can undertake a host of repairs including restoring the box, hardwood sill repairs or replacements, outer lining and architrave repairs or replacements. The sashes are also restored. Construction Joints in the sashes, glazing bars and bottom/top rails can all be restored. 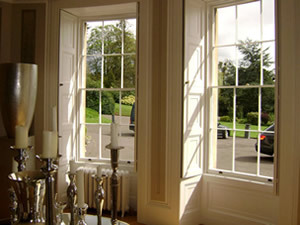 The sash window is fitted with new cords and rebalanced so it operates smoothly in both directions. The use of traditional lead weights are used to ensure the sash is properly rebalanced. The window can draught proofed using a paint resistant draught proofing system that is concealed from view. The beads named as Parting and Staff beads that hold the sashes in place is where our unique system of draught proofing is concealed. 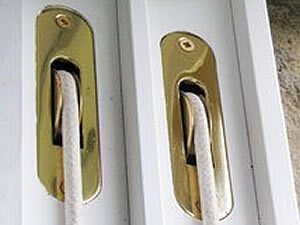 We also offer a wide choice of Period locks, lifts, security stops and sash handles. We apply a high quality preservative to protect the newly restored window prior to decorating. We also offer an in house painting service to complete the renovation with no fuss or additional painters to organise.